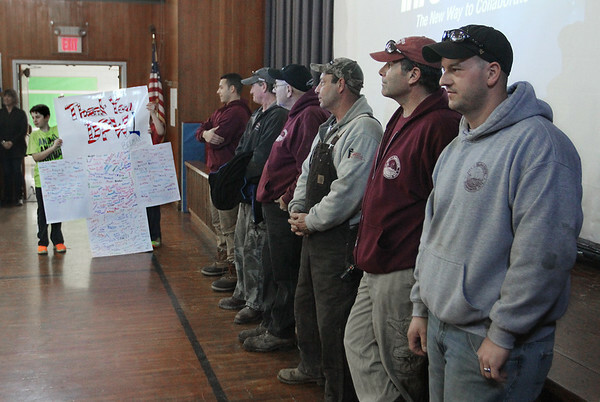 Fifth graders Tristen Mitchell, left, and Timmy Marrone hold a large card, signed by everyone at the school, thanking DPW snow removal crews for their hard work this winter during a special event Tuesday morning at Beeman Memorial Elementary School in Gloucester. Students watched a video adaptation of Virginia Lee Burton's 1943 children's book "Katy and the Big Snow, a book about a snow plow named Katy, and refreshments were offered to the real-life plow drivers. Among the DPW workers who were thanked are, from right: Joe Johnson, Tony Testaverde, John Harris, John Frost, Mike Siilva and Kevin Mazzeo.